Prokaryotes (from Greek: pro- “before” + karyon “nut,” referring to the cell nucleus, + suffix -otos, pl. -otes; also spelled "procaryotes") are organisms without a cell nucleus (= karyon), or indeed any other membrane-bound organelles. They are, in most cases, unicellular and in rare cases, multicellular. This set of characteristics is distinct from eukaryotes (also spelled "eucaryotes"), organisms that have cell nuclei and may be variously unicellular or multicellular. The difference between the structure of prokaryotes and eukaryotes is so great that it is considered to be the most important distinction among groups of organisms. Most prokaryotes are bacteria, and the two terms are often treated as synonyms. However, Carl Woese has proposed dividing prokaryotes into the bacteria and archaea (originally eubacteria and archaebacteria) because of the significant genetic differences between the two. This arrangement of eukaryote, bacteria, and archaea is called the three-domain system, replacing the two-empire system of simply eukaryote and prokaryote. A cooperative, symbiotic relationship involving prokaryotes living within other cells has been proposed by Lynn Margulis for the origin of mitochondria and chloroplasts in eukaryotes. If such an explanation of origins would be correct, then the mitochondria and chloroplasts as endosymbionts of eukaryotes would offer a powerful signal that in addition to Darwinian competition, symbiosis and cooperation also have been essential at least to some stages of the evolutionary process. Prokaryotes are found in nearly all environments on earth. Archaea, in particular, seem to thrive in harsh conditions, such as high temperatures or salinity. Organisms such as these are referred to as extremophiles. Among archaea, the methanogens (whose metabolic waste is methane) survive only in the absence of free oxygen (such as bottom of bogs or sewage treatment plants or in the digestive tracts of sheep and cattle); the extreme halophiles only live in areas of high salt concentrations (such as the Great Salt Lake or Dead Sea); and the thermoacidophiles live in places that are very acidic and where temperatures are very high (such as acidic, hot springs) (Towle 1989). Some other archaea live near volcanic vents miles below the surface of the ocean and utilize sulfur gases as their food. While many bacteria (Eubacteria or true bacteria) are free-living in soil or water, there are also many bacteria that live in or on the bodies of other organisms, including humans. Sometimes this leads to a life-threatening bacterial infection, but in many cases the organisms are harmless or even beneficial to the host. The cell structure of prokaryotes differs greatly from that of eukaryotes in many ways. The defining characteristic is, of course, the absence of a nucleus or nuclear envelope. Prokaryotes also lack membrane-bound cell compartments such as vacuoles, endoplasmic reticula, mitochondria, and chloroplasts. In eukaryotes, the latter two perform various metabolic processes and are believed to have been derived from endosymbiotic bacteria (see Endosymbiotic theory below). 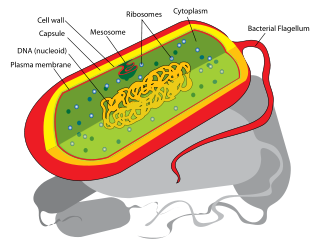 Prokaryotes also have cell walls, while some eukaryotes, particularly animals, do not. Both eukaryotes and prokaryotes have structures called ribosomes, which produce protein, but prokaryotic ribosomes are smaller than those of eukaryotes. Prokaryotes are usually much smaller than eukaryotic cells, having roughly one tenth the diameter of eukaryotes. Prokaryotes have a single circular (only exceptionally linear, as in Borrelia burgdorferi or the Streptomyces) chromosome, contained within a region called nucleoid, rather than in a membrane-bound nucleus. They may also have various small circular pieces of DNA called plasmids spread throughout the cell. Reproduction in prokaryotes is most often asexual, through binary fission. In this process, the chromosome is duplicated and attaches to the cell membrane, and then the cell divides in two. However, prokaryotes show a variety of parasexual processes, such as transformation and transduction, in which DNA is transferred between cells, . While prokaryotes are nearly always unicellular, some are capable of forming groups of cells called colonies. Colonies are formed by organisms that remain attached following cell division, sometimes through the help of a secreted slime layer. Unlike many eukaryotic multicellular organisms, each member of the colony is undifferentiated and capable of free-living. Individuals that make up such bacterial colonies most often still act independently of one another. Prokaryotes have a larger surface area to volume ratio than eukaryotes. This correlates with prokaryotes having a higher metabolic rate, a higher growth rate, and thus a smaller generation time as compared to the eukaryotes. Some research  indicates that at least some prokaryotes contain protein-enclosed microcompartments which can be seen as primitive organelles. It is generally accepted that the first living cells were some form of prokaryote. Fossilized prokaryotes three and a half billion years old have been discovered, and prokaryotes are perhaps the most successful and abundant organism even today. In contrast, the eukaryote only appeared approximately one and a half billion years ago. While earth is the only known place where prokaryotes exist, some have suggested that structures within a Martian meteorite should be interpreted as fossil prokaryotes, but this is extremely doubtful. Prokaryotes diversified greatly throughout their long existence. The metabolism of prokaryotes is far more varied than that of eukaryotes, leading to many highly distinct types of prokaryotes. For example, in addition to using photosynthesis or an organic form of carbon for energy like eukaryotes do, some prokaryotes may obtain energy from inorganic chemicals such as hydrogen sulfide. This has enabled the prokaryotes to thrive and reproduce. Today, bacteria can be found in the cold of Antarctica and in the hot Yellowstone springs, while archaeans can be found in environments above 100 °C, or in highly saline, acidic, or alkaline water. It is generally considered that the mitochondria of eukaryotes derive from prokaryotes (probably purple non-sulfur bacteria) that once were symbionts of either another species of prokaryote or some other cell type. Mitochondria are an almost universal component of eukaryotes. A similar origin is proposed for chloroplasts, which confer the capacity of photosynthesis onto plants. Such a symbiotic relationship would have given an advantage to the host cell in that the symbiont bacteria could conduct cellular respiration in cells that had relied only on glycolysis and fermentation, or the symbiont bacteria could perform photosynthesis in cells that had lacked chlorophyll. Among evidences for this theory is the fact that mitochondria contain ribosomes and DNA, and mitochondria are only formed by division of other mitochondria. Mitochondrial ribosomes are also of the 70S bacterial type, rather than the 80S type ribosomes found elsewhere in the cell. Chloroplasts also contain DNA, and it is nearly identical to that in portions of bacterial DNA. Furthermore, some chloroplasts strongly resemble in structure cyanobacteria. The double layer membrane of mitochondria and chloroplasts is chemically different than the membrane surrounding the nucleus. Cann, R. L., M. Stoneking, and A. C. Wilson. 1987. “Mitochondrial DNA and human evolution.” Nature 325: 31-36. Margulis L. and D. Sagan. 1986. Microcosmos. New York: Summit Books. Towle, A. 1989. Modern Biology. Austin, TX: Holt, Rinehart and Winston. This page was last modified on 4 April 2008, at 00:18.